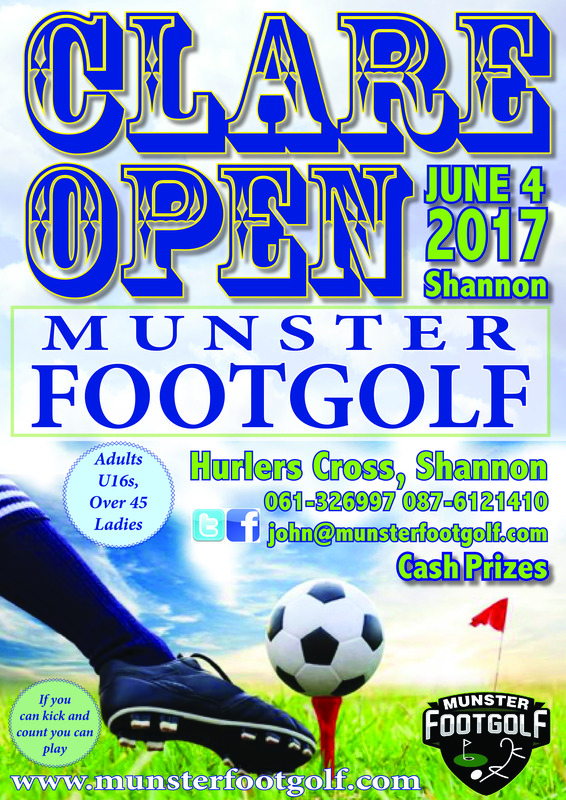 On June 4 next, Munster Footgolf will host the Clare Open at its Hurlers Cross course. 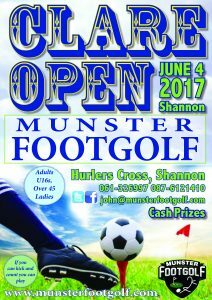 This is the first year of the event which will be part of the FootGolf Ireland National Tour 2017. Competitions for adults, u16s, over 45s and ladies all to be hosted on the day. A total of 11 events played over 36 holes make up the Tour with competitors best 8 events counting towards the overall standings in the race to be crowned Irish FootGolf Champion 2017. The Irish Plate will be awarded to the best Irish player at the Irish Open. The team league competition continues in the same vein with the best 3 scores counting from each teams best 8 events to decide the FootGolf League Team Champions 2017. A new addition to the Tour is the Inter-Club FootGolf Cup team event which takes place at Galway FootGolf in Loughrea. This competition will mix the best parts of Round Robin and Ryder Cup to crown the FootGolf Cup Champions 2017. 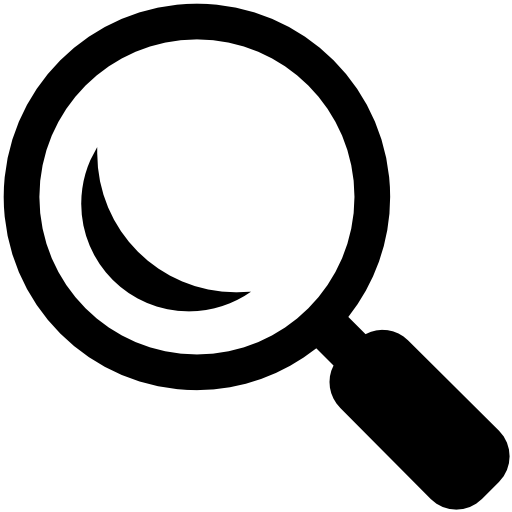 All Open competitions are played over 36 holes and begin at 11am sharp, unless otherwise stated. All competition dates subject to change. Strictly NO football boots/blades/moldies of any description. Astro/Runners ONLY. All domestic competitions carry crucial FIFG World Ranking points. Player Registration for the National Tour costs €40 per player (€30 for ladies, juniors & first-time registrants) and includes FIFG World Ranking registration. Players can REGISTER HERE. All competition entries (excl. Irish Open) cost €25 for men and €15 for ladies, juniors and first-time competitors, payable on the day. Cash prizes payable to winners will be paid within 14 days of competition. Details of the Champion of Champions Invitational will be announced towards the end of the year. It will be a unique fourball made up of the top ranked FIFG Irish player vs the top IFGA Ranked player vs the Irish Plate Winner vs the top ranked EFT Irish player. In cases where an overlap exists, the 2nd & 3rd best in each category will be invited, in the order described. The winner will be crowned Champion of Champions 2017.